Forkæl din indre fashionista med en shoppingudflugt til Postiano fra Sorrento. Nyd en shopping tur til den fashionable og smukke kystby Positano for at jage på tøj, smykker, keramik, boligindretning, tilbehør, skræddersyede sko og meget mere. Udforsk de mange smarte butikker, der spænder Positano's smukke gader, og beundrer udsigten til havet, mens du går, før du vender tilbage til Sorrento om eftermiddagen. 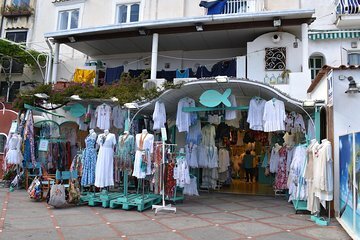 Start din shopping tur om morgenen på dit hotel eller udpeget mødested i Sorrento, hvor din minibus venter og nyde Middelhavet udsigt 20 minutters kørsel til Positano. Bliv faldet i centrum af byen, hvor de store busser ikke kan gå, for nem adgang til de mange butikker og caféer. Tilbring næsten tre timer på jagt efter skatte blandt de utallige butikker, der ligger i Positano's smalle gader. Vind vej op og ned Via dei Mulini, den største shoppinggade og Via Pasitea, hvor du kan gennemse i en af ​​de originale butikker fra byens 1960-tallet. Måske finder du nogle nye tøj, en ædle antikke, et farverigt stykke vintage smykker eller italienske sengetøj eller keramik til dit hjem. Eller måske er den perfekte Positano-souvenir et par håndlavede lædersandaler, der er specialfremstillede til dig, mens du venter. Mød din minibuss på den forudbestemte tid i slutningen af ​​din shopping spree for returkørsel til Sorrento. yes beautifull possitano, we were picked up from our hotel and spent a few hours relaxing in this lovely town, excellant driver and very comfy air conditioned mini bus. It was a nice trip. The driver was very good. The ride there is beautiful, but you have to know how to drive there in order to get to Positano safely. I wish the drop off area would have been in a more convenient spot to get to the shopping areas. It would have been nicer to have more time there too. We went on two trips from Sorrento with Viator a day in Capri and a shopping trip to Positana..
We were picked up from just outside our hotel at 8.30am . This had been arranged by Viator who had contacted us at our hotel the previous day. We had a people carrier type vehicle which was pristine . There were six of us and the car was spacious and comfortable. Our driver Roberto was great , he was knowledgeable about the local area and kept us amused with snippets of information about everything. He was a safe and careful driver - important when driving around some of the sheer drop narrow roads! It took about a hour to get to Positano and we had a couple of hours there which was just right. The town itself is very picturesque with loads of photo opportunities, there are lovely little shops and cafes leading to a beach and plenty of cafes to sit and people watch. We were back at our hotel by about 1pm. A lovely morning out , would highly recommend! Courteous and friendly driver, comfortable journey with experienced and safe driving. Beautiful place will definitely go back . We booked this trip to Positano before leaving England and although when we arrived in Sorrento we were told there weren't enough people for the trip to go ahead, Viator assured us we could have a refund or do the trip on another day - which is what we plumped for. We weren't disappointed. Our mini-bus driver Luca was superb, very friendly and so skilled with his driving down the very narrow streets into Positano. We had a good 3 hours of exploring this wonderful village/town that virtually tumbles into the sea. Although the goods in the shops are more expensive than Sorrento, they are a little different and we both did actually buy something a bit special and exclusive. We also had lunch in the local bakery/restaurant/ice-cream shop, lovely fresh food, beautifully presented and actually as reasonably priced as the restaurants in Sorrento, great to watch the world go by and sample the delights of Italy. Positano is very pretty and we both were reluctant to leave this unique little place. We had a wonderful entertaining ride back to Sorrento with Luca, who played some typical Italian songs for us all to sing along to and of course in true Italian style he joined in with his native tongue! Thank you Luca and thank you Viator for ensuring we all had a wonderful time in this truly beautiful unrivalled country. One last word for people unsure of using Viator - don't hesitate to use them, they do keep in contact with you or your hotel regarding trips and any alterations. We look forward to booking with them again.